For men, shaving is a ritual that can be tiresome. From dull razors to bad shaving creams, the task can be a hated part of the morning routine. Barbershop Shave Soap is looking to make the experience better. This natural vegetable shave soap is gentler to the skin (and easier on animals! Just ask them!). Free of synthetic fragrances, dyes and preservatives. Small, compact sized tin is perfect for taking with you wherever you need to go. My husband used this shave soap recently. After a long weekend in the sun, he found that the shave soap worked well on his sun-drenched skin. With a lot of lather, it was easy to shave. Most importantly, his skin felt smooth and moisturized. Plus, the fragrance was subtle. Barbershop Shave Soap can be purchased online at Amazon.com. 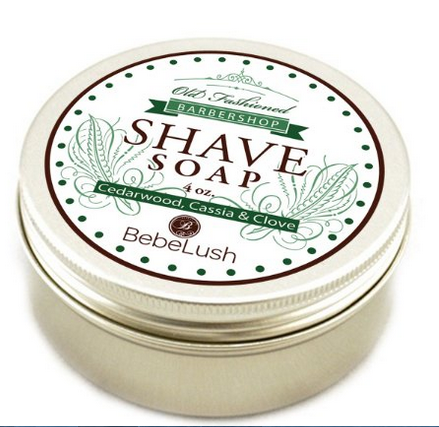 The 4 oz size is available in two scents, bay rum, orange and clove and cedarwood, cassia and clove. It retails for approximately $14.95. Would you like to try the Barbershop Shave Soap? Please use the Rafflecopter to enter.